If you are on the lookout for a lehenga shop in Kolkata where you can find your dream wedding lehenga, then this list is curated just for you. Shopping for a bridal trousseau is one of the most stressful pre-wedding jobs. But, worry not, if you scout these 10 lehenga shops in Kolkata, you are sure to find the best bridal lehenga in Kolkata for your big day! In case you are already in the shopping hub of the city for your wedding shopping, then you can also check out these 10 lehenga shops in Burrabazar Kolkata. Vedam Kolkata is a trusted name among most shoppers in the ‘City of Joy’. 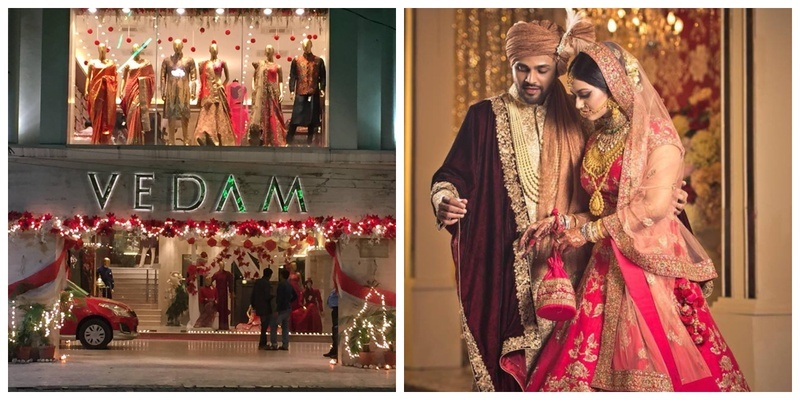 Vedam is one of the best lehenga shops in Kolkata and has a colossal range of bridal wear suited for all budgets. Drop by at Simaaya to find the widest range of bridal lehengas at affordable prices. If you are checking out a lehenga collection in Kolkata with price, then you can even visit Simaaya online to have a look! The price range of lehengas starts at Rs. 3775 at Simaaya. Tanshi Bridal at Park Street is one of the top lehenga shops in Kolkata to shop for your bridal trousseau. They have a wide range of bridal lehengas in traditional as well as contemporary styles that are sure to catch your fancy! If you are looking for a stylish bridal lehenga in Kolkata, then you must stop by at Sasya. They have some amazing bridal lehenga designs in different colours and styles for all of your wedding functions. Saroj Jalan is a bridal lehenga designer in Kolkata who specialises in making wedding outfits that are traditionally Indian but with a hint of modernism to ensure that all you brides find their dream bridal attires. Myra in Dharmatala is one of the best shops where you can find a stylish and affordable bridal lehenga in Kolkata. They also stock bridal gowns, sarees and unstitched salwar suits for all your wedding shopping needs. If you have always dreamt of wearing a designer bridal lehenga on your big day, then Manoj Agarwal’s studio in Kolkata is a must visit. He has dressed a lot of real brides on their wedding day and is known to design some really stylish, lightweight and easy to wear bridal lehengas. You can easily find one of the best designer lehengas in Kolkata at Manoj Agarwal. Housing more than 150 brands from across India, Moha Atelier is a heaven for wedding shopping in Kolkata. Here, you will find everything from bridal lehengas and receptions gowns to sarees and Anarkali suits that you can shop for your wedding as well as pre-wedding functions. Estri is a lehenga shop in Kolkata where you can find everything bridal. They have a vast collection of modern lehengas, which are designed for the modern bride. 85 Lansdowne is a concept store, which was envisioned as a place where can shop for an entire wedding look – from outfits and footwear to bags and accessories all under one roof. It houses over 45 designers from across the country, so you are sure to find the perfect bridal lehenga in Kolkata. Have you visited any of these bridal lehenga shops in Kolkata? Or did I just give you a whole list of places to visit for wedding shopping in Kolkata?